Obtain all three Elder Scrolls for Dexion Evicus. Find the last Elder Scroll. 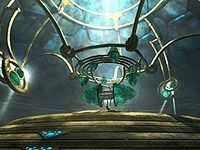 After the completion of the quest Prophet, you will be told by Dexion Evicus that all three Elder Scrolls must be obtained in order for him to read the whole prophecy. To continue with the Dawnguard questline, the quest Discerning the Transmundane must be completed at least to the point where you acquire the Elder Scroll (Dragon). If you have already obtained and subsequently sold the Elder Scroll to Urag gro-Shub at the College of Winterhold (only possible after completing Alduin's Bane), you must buy back the Elder Scroll. He'll sell it back for 4000 gold, but he can be persuaded to sell it for half price if you are the Arch-Mage or 3000 gold if you aren't. If you're doing Discerning the Transmundane as part of this quest and have Serana with you, you may want to avoid Alftand to get to Blackreach, as she will frequently raise nearby corpses, including the ones you'll want later, during the blood harvest portion of that quest. 20 In order to discover the location of Auriel's Bow, I need to acquire the Elder Scroll that foretells the interactions of the dragons with the history of Nirn. In order to begin my search, I've been told to ask at the College of Winterhold. 30 In order to discover the location of Auriel's Bow, I need to acquire the Elder Scroll that foretells the interactions of the dragons with the history of Nirn. Having sold that particular scroll to Urag gro-Shub at the College of Winterhold, I'll need to return there to see if he's willing to sell it back. 200 Finishes quest I've successfully made contact with Urag gro-Shub at the College of Winterhold regarding the Elder Scroll that foretells the interactions of the dragons with the history of Nirn. Finishes quest I've successfully purchased the Elder Scroll that foretells the interactions of the dragons with the history of Nirn from Urag gro-Shub at the College of Winterhold. Finishes quest I've successfully made contact with a strange old man named Septimus Signus who appears to have information regarding the Elder Scroll that foretells the interactions of the dragons with the history of Nirn. The following empty quest stages were omitted from the table: 10. On the PC, it is possible to use the console to advance through the quest by entering setstage DLC1VQElderHandler stage, where stage is the number of the stage you wish to complete. It is not possible to un-complete (i.e. go back) quest stages, but it is possible to clear all stages of the quest using resetquest DLC1VQElderHandler. Esta página foi modificada pela última vez à(s) 20h05min de 31 de março de 2015.